This article is special to me because the “makeup disasters” I came across right from my childhood when we attended weddings. I used to wonder how on earth perfectly pretty brides looked SO horrendous on their wedding day: caked up dolls. This question made me look up magazines,notice TV actresses (no internet access during those days) and make mental notes what to do and what to avoid. We hate to prick the balloon ladies, but foundation does NOT make you look fair. In fact, it is not even meant to do so! Foundations are to be used in a shade which perfectly matches with your skin tone to “tone” your complexion and make it look even. And a glowing smooth complexion in ANY shade looks the best at any day. Trust me, fair skin is not always equal to good skin. 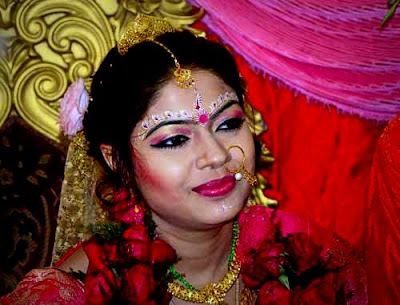 Unfortunately, what parlors in small towns do to their brides is the complete opposite: Light foundation caked up all over the face of a bride irrespective of her natural skin tone. Result? ASH-GREY skin which is quite akin to a horror story main lead :-/ And how can I forget, a dark neck with the ash-color face, as the artist quite comfortably ignores the neck while applying foundation! What to check with your makeup artist: A range of foundation shades in her kit. Good makeup artist will always keep most complexions in mind and will mix two or more foundation shades to acheive the shade best matched to your skin. If she has just one or two shades RUN away from her/him. Ladies, you do not need to wear red eyeshadow with red banarasi and blue/green eyeshadow with blue/green banarasi. 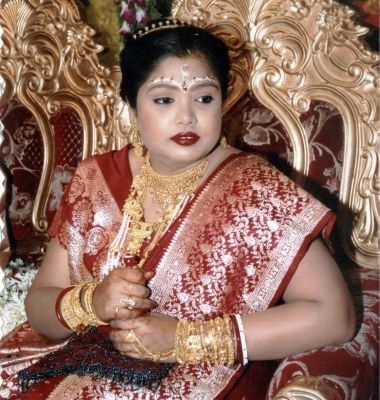 Almost 99% of small town parlors will have one shimmery eyeshadow pallete with various screaming bold colors which they happily use on the brides “matching” her saree color! 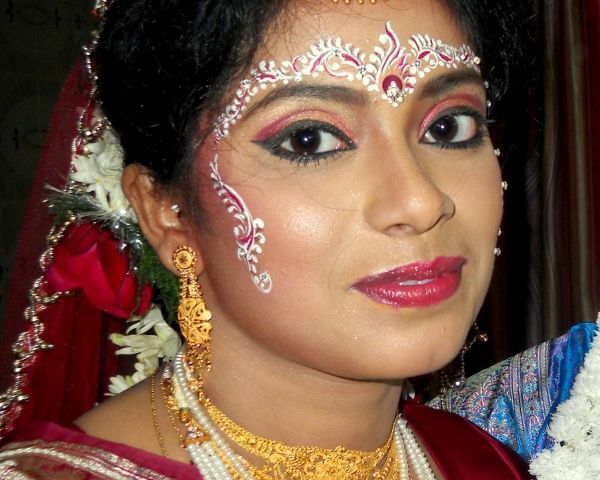 Bengalis have naturally big and beautifully shaped eyes. A nice golden, a bronze, and matte brown eyeshadow and lots of kajal and eyeliner is enough to dramatize your eyes with ANY color banarasi. Reds/ pinks can also be used if your artist knows the art of blending the crease of the eyelid well with matte brown eyeshadow. Leave your blues and greens for your westerns or other ethnics like anarkali salwars et al. What to check with your makeup artist: See if he/she has enough eyeshadow palettes with matte shades. 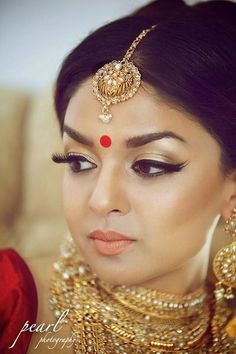 If he does not have any neutral shade eye shadows like brown, beige, taupe, cream or black, it is very likely that the concept of using subtle colors on brides is foreign to him. Start searching for another artist. This bring us to our third point: Eye shadow belnding. 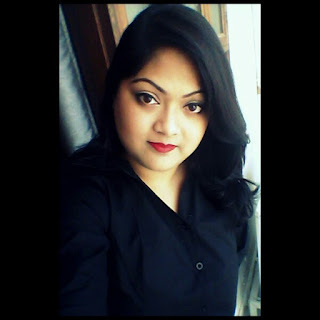 When I had started recovering from disaster makeup-walis of our town and was just getting awestruck by the wonderful professional makeup artists an odd thing struck me. I have seen quite a few artists using gold and red on the eyelids but not bothering to blend both of them with each other or the creaseline! :-o Any eye shadow will make your eyes look like an alien if not blended properly. The one thing which distinguishes a Bengali bride from any other bride is the beautiful designs made with “Chandan” on her forehead along with the bright red bindi. These days mostly acrylic colors are used in white and yellow to give the same effect as chandan but with ease of application. If you stay in a place where there are no expert chandan artists, then your best shot is to just apply dots of white around the big red teep (bindi) You can never go wrong with this simplistic design. Else, the untrained, over-ethusiastic and absolutely pathetic parlor-walis will “gift” you THIS on your day. 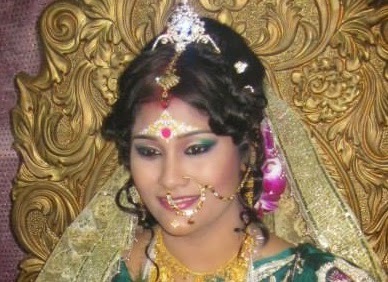 What to check with your makeup artist: See pictures of brides done by him/her prior to your wedding. Don’t make the mistake of showing him your favorite design and asking if he can replicate it. OF COURSE he will say a yes! Don’t fall for the trap. Let his work speak for him. If not convinced, get a friend who is good with brushes and ask her/him to draw a simple design around your bindi. What to check with your makeup artist: See if he/she has enough variety of lipstick shades in her kit. Signs of danger are one maroon lipstick and one brownish red lipstick. A safer option is to always keep your lipstick shade in your personal kit which you have picked up after trials at the stores. Another sad thing I noticed in the makeup-disasters of the brides are the excessive use of blush and contour: Either that pink blush is like a BIG circle on both her cheeks, or that brown contour is like a blotch of mud on her cheek :-/ The untrained makeup artists forget that “less is more” when it comes to blush and contour for a bride. A soft blush, a slight contour and a bit of highlighting is all she needs to look flawless. You do not need to put two kilos of each on your face and look like a clown. What to check with your makeup artist: Check if he/she has a proper blush palette or two three shades of blushes in the kit. Every complexion is different and there is a perfect blush for each complexion. Also see his brush kit. He/she should have a proper blending brush for blending the blush, contour and highlighter really well into your skin. Enjoyed Reading This? You will also love these! 2. The "Aalta" Allure: Mehendi or Aalta for the wedding?? 3. 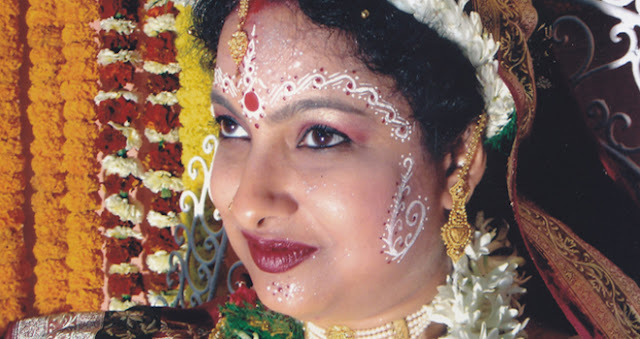 Bengali Bridal Jewellery: The Dazzling "Bodhu"